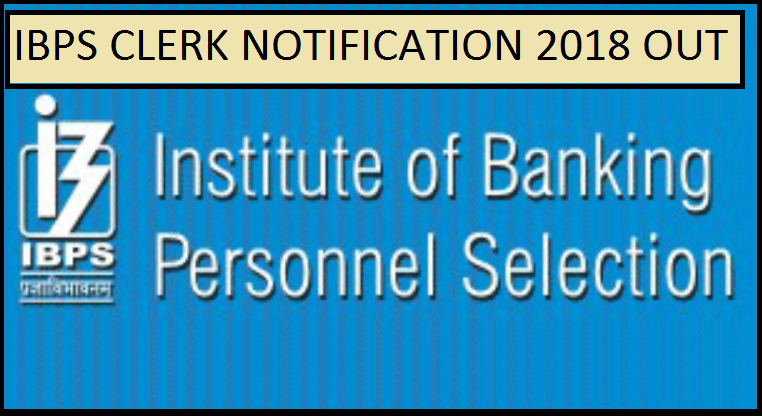 IBPS Clerk Recruitment 2018 Notification: The IBPS Clerk Notification 2018 has been released on the official website of Institute of Banking Personnel Selection. Candidates can register themselves at ibps.in from September 18, 2018 after checking the eligibility criteria. IBPS Clerk Recruitment 2018 Notification: The Institute of Banking Personnel Selection has released the IBPS Clerk Notification 2018 on its official website – ibps.in. Interested candidates can check the notification online and see if they are eligible to apply for the same. The registration process will be opened for the interested candidates on September 18, 2018 and they are advised to register themselves through the official website. According to the notification, the last date for registration has been scheduled for to October 10, 2018. Applicants must have a Graduation Degree in any discipline from a recognised university under the Govt. Of India or any equivalent qualification recognized as such by the Central Government. Candidates must also have an additional qualification of operating and working knowledge in computer systems which is mandatory i.e. candidates should have Certificate/Diploma/Degree in computer perations/Language/ should have studied Computer / Information Technology as one of the subjects in the High School/College/Institute. How to apply for IBPS Clerk Recruitment 2018 online? Now click on “CLICK HERE TO APPLY ONLINE FOR CRP- Clerks (CRP-Clerks-VIII)” to open the On-Line Application Form. A registration number and password will be generated by the system and displayed on the screen. Candidates need to indicate in the state to which he/she opts for provisional allotment on selection.